Embedded SNMP & CLI Developer Tools– SNMP code generation wizards with RTOS specific C++ SDK libraries for development of Embedded SNMPv3 Agents or Embedded SNMPv3 Managers, included is the SNMPv3 Configuration Editor. The CLI code generation wizard with RTOS specific CLI C++ SDK libraries for development of Embedded CLI Agents. RTOS’es & OS’s such as Embedded & Desktop Linux, QNX Neutrino, VxWorks, Windows Embedded are supported. Development wizards are hosted under Windows and generate complete projects (sources, headers and Make / Project files) for target RTOS development platforms. Windows SNMP Developer Tools – SNMP code generation wizards with SNMP C++ SDK libraries for development of standalone Windows SNMPv3 Agents, or extension subagent DLL’s for Windows SNMP Master Agent Service, or for development of product specific SNMPv3 Managers for Windows. Finally MIB Compiler and SNMPv3 libraries are also available as Controls for development of SNMPv3 Managers in C# under .NET Windows environment. SNMP Applications for Windows & Linux – applications such as SNMPv3 Agent Service for Windows / Linux Servers, MIB Browsers, MIB Builder, SNMP Traffic Monitor, SNMP Middle Layer Managers with proxy support, SQL storage, reporting and trending. SNMP Apps & Developer Tools for AFDX® / ARINC664 – applications such as snmpXplorer that combines the robust SNMP monitoring, test and analysis features with industry leading ARINC664 interface modules, SNMP Agent and SNMP Manager software development tools supporting operations over the AFDX® / ARINC64 networks. SNMP Apps & Developer Tools for Transportation Industry – software development tools and libraries for embedded and desktop target systems, aiding developers of applications requiring NTCIP Transportation Management Protocol agent and / or manager functionality. All products support IPv6 communications, Windows and Linux SDK C++ library products natively support 32 bit and 64 bit code. For SNMP / CLI solutions integrated with NETConf and RESTConf access please see our NETConf & YANG development and products section. The SNMP Agent generation wizard, in addition to generating a very complete MIB dependant agent code, it automatically builds Simple Development Console interface providing console and optionally HTTP access to the MIB objects implementations. 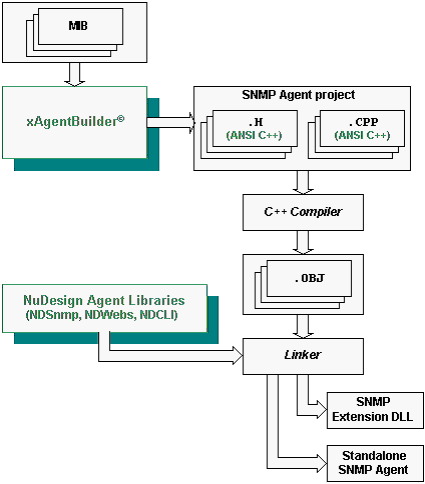 The developer simply adds instrumentation code to the generated callbacks in Agent’s methods then links it to NuDesign’s SNMPv3 Agent OS/RTOS target specific SDK C++ libraries creating a complete SNMPv3 Agent project. For extending the Simple Development Console interface into a fully blown hierarchical Command Line Interface (CLI) management application please review the CLI generation wizard with its RTOS specific CLI SDK C++ libraries. It provides for implementation of command hierarchy navigation, command completion, line editing, history and provides a basic set of common commands. Adding custom commands and device configuration requires a few simple steps. The CLI access is via console, serial, Telnet or SSH protocol, depending on system capabilities. Similarly, the SNMP Manager generation wizard contains NuDesign’s MIB Compiler libraries and auto-generates a very complete MIB dependant manager code. The trap reception code for all MIB-defined traps is generated. The developer adds his application specific code dealing with data from already decoded replies, based on pre-compiled MIB objects, then links it to NuDesign’s SNMPv3 Manager OS/RTOS specific SDK C++ libraries creating a complete code for SNMPv3 Manager projects.